The Millennium Hall sits at the centre of Upton Bishop and is a thriving hub of activity. More than 20 groups use the hall every month for activities as diverse as keep fit, baby and toddler classes, needlecraft and indoor bowls, badminton, short mat bowls, tango and Tai Chi. Click here for the full list of groups in the village. The postcode for the Millennium Hall is HR9 7TU. 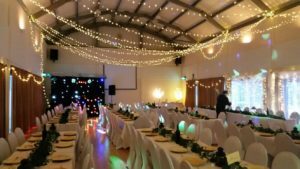 It is available for hire by individuals and groups, for weddings, parties, workshops and regular groups, and other events. 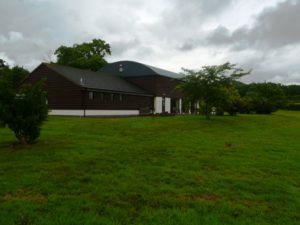 The main hall is 20m x 10m with a high ceiling which makes it suitable for badminton and similar sports. The main hall has a capacity of 200. The smaller committee room is ideal for small groups and seats 12-14. The hall has a large fully equipped kitchen with two ovens and a hob. White crockery and cutlery is available for hire if required. The kitchen has a serving area which can be used as a bar. The hall comes with tables for up to 120 and 180 chairs. There is ample secure car parking and the car park is locked at night which is ideal for guests wishing to leave cars overnight. Contact Jane Pendlebury 01989 780763 who will be happy to show you round the facilities. The Millennium Hall was opened in 2000. It was built with the help of community fund raising, a national lottery grant and a Government loan. 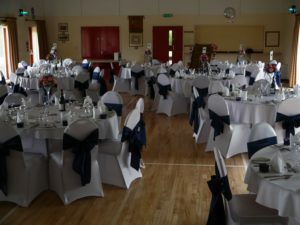 If you are interested in hiring the hall for an event you will need to complete the enquiry form and give details of the date and time required, numbers of people involved and what type of event it is. Yoga class with Penny Jolly every Wednesday from 1 -2.30pm in the Millennium Hall.